Eighteen-year-old Paula Herring was “a girl full of the joy of being alive . . . warm, lovable, intensely energetic, and full of plans for the future.” On February 22, 1964, the University of Tennessee, Knoxville, freshmen was shot to death in the den of her mother’s suburban Nashville home. In the next room slept her six-year-old brother, apparently unaware of the gruesome event. A few months later a judge’s son is convicted of the crime. Decades after the slaying, author Michael Bishop stumbled upon a secret file related to the case and with the help of some of the world’s top forensic experts—including forensic psychologist Richard Walter (aka “the living Sherlock Holmes”) he uncovered the truth of what really happened to Paula Herring, and his conclusions are completely different from what the public was initially led to believe. In 1997, Michael Bishop, a sales executive for a healthcare learning company accidently came across files that contained information about the Herring murder case. For the past two decades he tenaciously investigated and enthusiastically followed the evidence trail, which led to a new theory of who might have actually murdered Paula Herring. In A Murder in Music City: Corruption, Scandal, and the Framing of an Innocent Man, Bishop lays out the shocking and overwhelming evidence that led to his startling conclusion that a small group of influential Nashville residents played a significant role in covering-up evidence and actively assisted in sending an innocent man to prison for a crime he did not commit. In this gripping page-turner, Bishop reveals the grisly realties and true story behind the murder of Paula Herring. This first time author and amateur detective proves to be amazingly effective in his writing abilities and his first-person description of the steps he used to discover evidence in the case gives the story a sense of proximity to the present. By relentlessly following every lead and using his “sales skills” to gain the trust of those he questioned, Bishop reveals plausible proof that John Randolph Clarke was indeed framed for the murder, and goes on to formulate a reasonable and disturbing theory as to the scandalous identity of the actual killer. 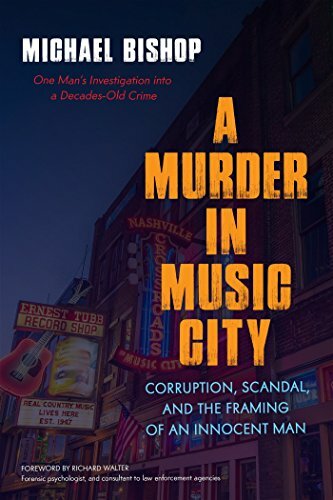 Overall, A Murder in Music City gives the reader a good sense of what it was like to live in 1960s Nashville, and as his investigation into this half a century’s old closed case unfolds into the present day. Bishop’s shocking and very plausible conclusions are thought provoking and compelling. But because it tends to follow the author’s own experiences with the case, the narrative unfortunately tends to get off track and bogs down in places. With that said, true crime enthusiasts will most certainly find this book to be hauntingly compelling. A highly recommended thrill ride of narrative true crime that tells a sad story of murder, family betrayal, and political corruption that is equal parts thought provoking, captivating, and unforgettable.